I make all of my measurements at my listening position. When I first started to use Acourate I tried making near-field measurements to start with a speaker correction before doing the room correction. However I found this to create some problems. In the first place the fall-off in the subwoofer response is faster in the near field relative to the far field because of the ‘boost’ provided by the wall in which the speakers are mounted (you would have similar effects with your corner mounted subs). A second reason is that the wave fronts from the ring structure of my QUADs need several feet before they become fully merged, so a near field measurement is of questionable validity. The third issue addresses the utility of a near field measurement. In order for this measurement to be valid one has to process the data in a different way from what one might do for the listening position measurement. If the two measurements are processed in exactly the same way then the listening position measurement modifies the near field measurement so that all of it’s parameters no longer exist as such and just the listening position measurement controls all. My QUADs are really full-range speakers (with QUADs alone I can get the system flat down to 30 Hz) and with my subs I really only have a two-way system so setting up is relatively easy. I work first with my subs. I apply my nominal crossover, measure the response, and calculate the correction coefficients by hand (meaning I use the appropriate Acourate functions individually and not the Room Macros). I load these coefficients and repeat the measurement. The measurement will be relatively close to the nominal crossover curve – but not exact. I then difference between the measurement and the nominal crossover and convolve this difference with the previous correction and get a new set of correction coefficients. I repeat this sequence as many times as I deem desirable. Fortunately my room treatments are such that I do not use the FDW computation while doing this. I can match the subs individually and get a IAAC of 1.0. I then make measurements at the system level. 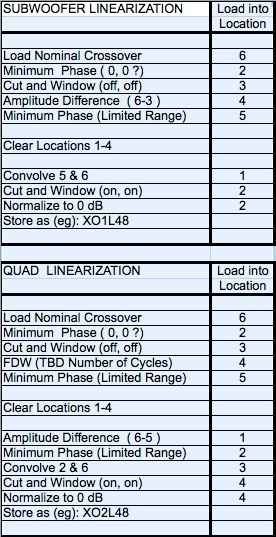 The first two steps are to set the correction gains so that the QUADs and subs are at about the same sensitivities and then to get the delays between the QUADs and subs correct. I then take a final measurement and process for the final correction coefficients. I will do the processing either by using the Room Macros or by hand. Uli has set up Macro 1 in such a way that I can bypass the psychoacoustic processing and he also added the filter gain issue in Macro 4 to save me work in generating a filter set. He also gave me the option of the final correction filters remaining at 262144 samples after the final convolution. When setting up for multichannel I take the same approach (except that the rear channels do not have subs at the moment). I measure each speaker set in pairs with one in the pair being the same front channel. I use this one front channel as reference and set the levels of every other speaker to the level of this one front channel (there was no fixing of the gain when I started). To get the delays correct I use a data file that I have generated that has Dirac pulses set so that I can see the relative timing between all of my channels. This allows me to get the delays correct to within one data sample. You do not incorporate room effects twice. Room effects will be somewhat constant (unless you move something – or the temperature changes) and so, if they are taken care of in the measurement, you will just see what was not corrected in the next measurement.